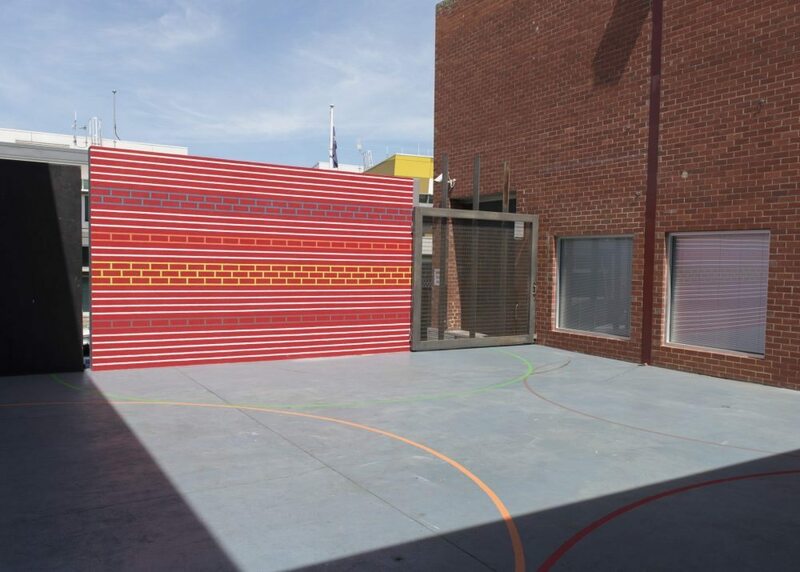 Anyone who has walked out alone, onto an empty sports oval, a silent AFL ground, or indeed any arena, will know that these empty arenas and playgrounds so often resonate with imaginative energy. They can become places of vivid reflection, even though they are silent and empty. Their latent dynamism is due to the potential they hold; the potential of competition and of play. 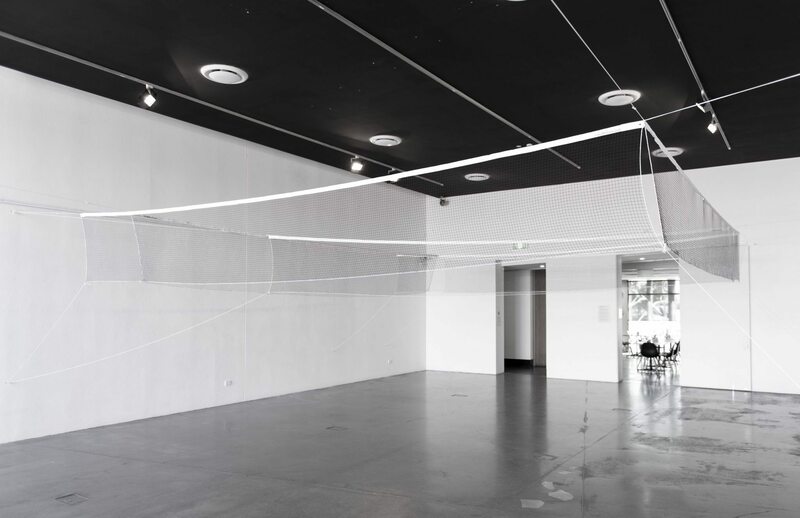 The latest work by Nick Selenitsch (Kangaroo Court) at LRG suggests that, it in a certain way, an art gallery may not be that different in atmosphere to a silent sports-field. In a gallery with the works on display, you are left to creatively assemble all the information in order to imagine. You could see the gallery as an arena, or a place, of potential action for yourself. Combining abstraction with materials derived from the worlds of sport, this work seeks to suggest a place for potential action, one which lingers in our imaginations. Looking closer, Kangaroo Court consists of two sports-derived ‘courts’. While they might look ‘sporting’, they are actually not for use, or they are actually for a different purpose. Sport has rules and clearly defined expectations of behaviour. Contemporary art has rules which are hidden, or keep changing unexpectedly, or are incomprehensible. Some rules are ragged, anarchic, rebellious or just plain puzzling. Here there are parallels between the title and meaning of a Kangaroo Court. In this kind of court, a rag tag judicial tribunal or a cobbled together assembly of amateurs is the law, know what they like and what they think is right. They make new rules and judgements on the fly, blatantly disregarding recognized standards. Nick Selenitsch’s courts, like those of a Kangaroo Court, are not to be completely trusted. You be the judge. Nick Selenitsch is a visual artist from Melbourne and is represented in Australia by Sutton Gallery.